These Candy Crush Jelly Level 98 cheats and tips will help you beat Jelly Level 98 of Candy Crush. 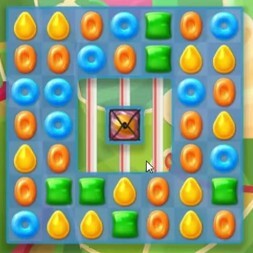 The objective of Candy Crush Jelly Level 98 is to spread jellies across the entire playing field in under 25 moves. Candy Crush Jelly Level 98 is a pretty easy one to manage as it is a medium difficulty level and can be won easily by using coloring candies. This makes it a lot easier to spread Jelly across the playing field although it does not mean that one must activate them in order to be able to spread Jelly. We go about activating them by hitting them primarily by using special candies. One also has an advantage of having candies of only four colors on the playing field so basically it’s an easy task. If one chooses not to follow this route; that is spreading the Jelly without having to go through activating coloring candy, then one should consider the combination of special candy and this will help quick spread of Jelly.